By the early 70s Samsonite style executive cases were becoming more of a common sight, on commuter trains, in offices and on aeroplanes. Samsonite took the attaché case to another level of luxury and style with the new Samsonite Classic 100. Convenience and practicality were the driving forces in the new design. Combination locks were new on attachés. But Samsonite's single combination lock, which let you lock the case discretely, was unique. It was also slightly taller, 3/4", clearly a practical benefit as now you could put two stacks of manila folders side by side or two ring binders. Of course it stood slightly taller than other cases, which may have brought other benefits in terms of looking important. Though, It was still small enough to be suitable for hand baggage on an plane. There was also a more comfortable carrying handle and a new interior with pockets and pen holders as well as the dividers. The Classic 100 sold alongside the Classic. When the Classic III was introduced in 1973, the right side up feature, stopping you from opening the case upside down, was also fitted to the Classic 100. (It is possible that the Classic 100 had this feature from launch in 1972, but it was not mentioned in any of the advertising). Samsonite was an international corporation with factories in the US, Canada and Belgium. The new case was manufactured in the US and Canada from 1972 and in Belgium from 1975. There were local market differences. The Classic 100 had different interiors in all three markets and the design of the interior changed over time. The US case either had a zip compartment at the front of the filing section, or two pockets. The European design was similar, but may have had an internal divider. The Canadian case was the most well finished. It had three compartments, holders for air-tickets, passport and pen and was finished in a colour co-ordinated faux suede. Perhaps US business travellers rarely went abroad by plane, but Canadian businessmen and UK ones (Canadian cases were sold in the UK market at least up to 1975) needed passport holders! Externally the early US cases had a heavy grain effect. Later cases were smooth finished. A variety of colours and grain finishes were used from 1972 to 1980. These are few of the ones I have seen in newspaper adverts. Cases for the European market were available from 1975 in black, brown, cedar or grey. 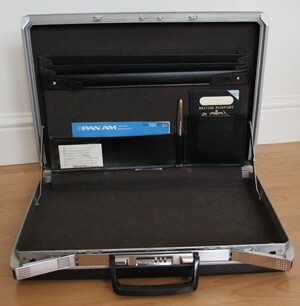 The case pictured in this article is a Canadian manufactured case for the UK market. It is believed to be made between 1973 and 1974.